His disappointment in Referee Bobby Marley's decisions in the Community Shield game against Arsenal. The first-half had seen Willian booked for diving in the penalty area despite there appearing to be contact with the knee of Hector Bellerin, while Pedro received a straight red card late in the second half after reaching the heel of Mohamed Elneny with his studs. 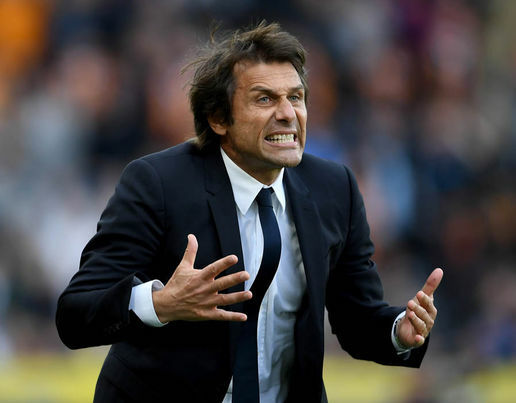 Chelsea had to played the last season's FA Cup final against Arsenal with 10 men for a period as well, with Victor Moses sent from the field that day, and Conte admitted his frustration that such a circumstance occurred again. "For sure there is a disappointment to finish for the second time with 10 men against Arsenal: first the FA Cup and now the Community Shield," Conte said at his postmatch news conference. "Honestly I didn't see the images [for Pedro's red card] and I didn't see also the yellow card for Willian. A lot of people told me the penalty was clear and for sure there is a bit of frustration but we have to respect the referee's decision, but sometimes these decisions make you a bit angry. "He [the referee] tried to explain to me about his decision but there wasn't time because I also wanted to ask him why there wasn't the penalty and the yellow card to Willian but then we would have stayed to speak until 9.00 p.m.
"But I repeat we must accept this decision. But it's for the second time: In the FA Cup there was also a controversial decision against us." The Chelsea Boss maintained that Morata will need more time to adapt to the Premier League environment then also used that opportunity to defend his decision to allow Courtois kick the free kick. "About the performance, I think today was a tough game for both teams and we tried to win," Conte added. "We tried to improve our physical condition also because in six days we have to start the league, but now the most important thing is to continue to work and to try to improve our team. "Courtois is one of the best players to kick a penalty. If you have a player that shows you during the training sessions to be one of the best then you pick him to play and to shoot the penalty, but don't forget also Morata is a forward and he did the same. "Morata needs to work but this is normal. He's stayed with us for only one week and it's very important to find a good physical condition and to understand our idea of football. He needs a bit of time but it's normal. It's the same for Rudiger and Bakayoko." Concerning transfers and what Morata and Michy Batshuayi can provide to the team that Diego Costa can't, Conte replied: "I hope in the future to have a different question than the necessity to improve our squad, or about our strikers. "I replied already and my reply is always the same. The truth is I always repeat the same." The Chelsea Boss believed so that there are six teams who can challenge for the Premier League title. "There are six teams in England who can fight for the title, all of them. And don't forget today Arsenal didn't play with many strong players," he said.